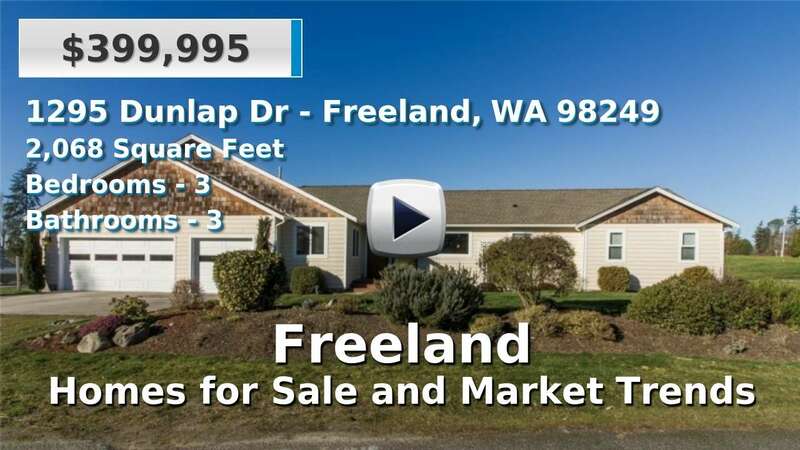 Freeland is a community on the southern end of Whidbey Island in northwestern Washington state. It is a part of Island County and has a population of about 2,000 people on Holmes Harbor in the Puget Sound. This small town island community has newer than average homes for sale and is known for its waterfront parks and beaches with year-round clamming. 3 Beds | 2.5 Baths | 1446 sq. Ft.
2 Beds | 2.75 Baths | 1392 sq. Ft.
2 Beds | 2.5 Baths | 1776 sq. Ft.
2 Beds | 1416 sq. Ft. Lot at end of the road on cul-de-sac. Potential for west side views in future. Water and electric at street. 2 Beds | 1 Baths | 1130 sq. Ft.
3 Beds | 4 Baths | 3098 sq. Ft.
3 Beds | 2 Baths | 1880 sq. Ft.
2 Beds | 2.25 Baths | 3610 sq. Ft.
3 Beds | 2.75 Baths | 1919 sq. Ft.